Meet Trotter, he would love to gallop in your garden or home. 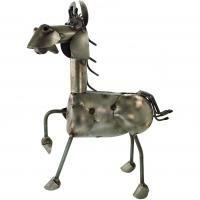 Made from reclaimed and upcycled metals he's a perfect companion for any environmentally conscious horse lover. Trotter is intentionally designed to rust if housed outdoors.